Henning Schulzrinne, SIP Services and Applications (Marcus-Evans), April 2001. Washington, DC. Joerg Ott, IIR SIP Congress 2001, May 2001, Stockholm, Sweden. Joerg Ott, marcus evans SIP Conference, May/June 2001, Geneva, Switzerland. Joerg Ott, VON Europe 2001, June 2001, Stockholm, Sweden. Henning Schulzrinne, 6th SIP Bake-off, December 2000. Santa Clara, California. Adam B. Roach. Voice-on-the-Net (VON) September, 2000. Atlanta, Georgia. Igor Faynberg (Bell Labs), Voice-on-the-Net (VON) September, 2000. Atlanta, Georgia. Dov Ben-Asher (Startek), Voice-on-the-Net (VON) September, 2000. Atlanta, Georgia. Yoram Arbel (Comox), Voice-on-the-Net (VON) September, 2000. Atlanta, Georgia. Steve Donovan (dynamicsoft), Voice-on-the-Net (VON) September, 2000. Atlanta, Georgia. Michael Doyle (Ubiquity), Voice-on-the-Net (VON) September, 2000. Atlanta, Georgia. Henry Sinnreich, Industry perspective talk at Voice-on-the-Net (VON) September, 2000. Atlanta, Georgia. Henning Schulzrinne, Industry perspective talk at Voice-on-the-Net (VON) September, 2000. Atlanta, Georgia. IP Telecom Services Workshop, Sept. 11, 2000. Atlanta, Georgia. Henning Schulzrinne, IETF August, 2000. Pittsburgh, Pennsylvania. Henry Sinnreich, VON Developers Conference, July 18, 2000. Boston, Massachusetts. Henning Schulzrinne, VON Developers Conference, July 18, 2000. Boston, Massachusetts. Jonathan Rosenberg, VON Europe, June 20, 2000. Stockholm, Sweden. Henning Schulzrinne, VON Europe, June 20, 2000. Stockholm, Sweden. Henry Sinnreich (based on J. Rosenberg's slide). February 2000. Jonathan Rosenberg, Carrier IP World Forum, Miami, Florida. February 14-17, 2000. Jonathan Rosenberg, Carrier IP World Forum, Miami, Florida. February 2000. OPENSIG'99, Carnegie Mellon University, Pittsburgh, USA, October 14-15, 1999. Fall VON, Atlanta, Georgia, September 29, 1999. Fall VON, Atlanta, Georgia, September 28, 1999. Presentation at VON Europe, Helsinki, June 1999. Presentation at Bell Laboratories, June 1999. VON Conference, Las Vegas, NV, April 1999. Summary of SIP status and introduction to jSIP. 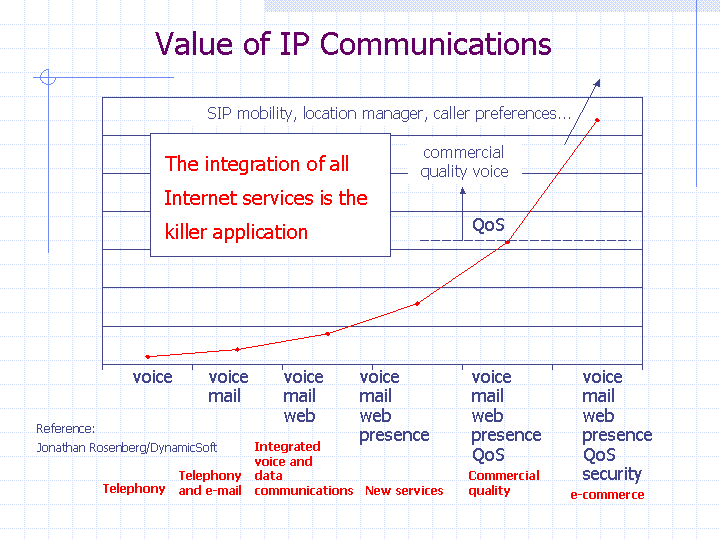 Argues that Internet telephony should not just emulate the existing telephone system, but rather strive to integrate telephony services with web, email, instant messaging, text chat and interactive games. Update on SIP standardization, bake-off results and future work items. Internet Multimedia Conferencing: What Now? Summary of new SIP-related work: sip-cgi, call processing language and caller preferences. IETF MMUSIC meeting, Chicago, August 1998. Summarizes changes agreed upon at the IETF Chicago meeting. Describes how SIP can fulfill the requirements of a presence information protocol ("buddy list"), by adding two methods, SUBSCRIBE and NOTIFY. VON Conference, Washington, DC, September 1998. Powerpoint slides from the Voice on the Net conference in Boston, Massachusetts, Sept. 25, 1997.